Baylis and Olivia Shanks began their association with Vanderbilt, and with each other, in the fall of 1938 when they were first-year graduate students in Professor John Hyden’s differential geometry class. That beginning led to successful conclusions both professional and personal: each received a Master’s degree in mathematics, and they were married in June 1940. Baylis Shanks received his B.A. degree from Millsaps College, his M.A. from Vanderbilt, and his Ph.D. from the University of Illinois, his work at Illinois having been interrupted by four and a half years in the Army Air Force during World War II. 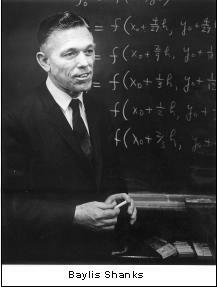 He returned to Vanderbilt in 1947 as an Assistant Professor of Mathematics. He was promoted to Associate Professor in 1949 and to Professor in 1954. He served as chairman of the Department of Mathematics from 1956 to 1969, and he retired with the title of Professor Emeritus in 1979. There were significant developments in mathematics at Vanderbilt during Shanks’ tenure, and he played a prominent role in each of them. The Ph.D. program was instituted, and the first two students wrote dissertations under his direction. He was chairman of the committee responsible for the first University computer center. The new mathematics building was planned while he was chairman, as was the merger of the two departments of mathematics (one in the College of Arts & Science and one in the School of Engineering). Shanks directed several institutes sponsored by the National Science Foundation and the Esso Educational Foundation. He served the University at large in a variety of ways – as a member of the Faculty Senate, secretary of the Faculty Council, chairman of the Educational Policy Committee, and director of the summer session, to name only a few. The wider mathematical community also benefited from his service as visiting lecturer, consultant, and chairman of the Southeastern Section of the Mathematical Association of America, and as chairman of the Tennessee Mathematics Teachers Association. As the space age dawned, Shanks shifted his research interest to the numerical solutions of differential equations. He received many NASA grants that provided support for his research as well as that of other faculty members and several graduate students. His integration formulas, which have played a crucial role in NASA’s orbital and interplanetary probes, have generated much interest in that type of research among mathematicians at home and abroad. Olivia Shanks received her B.A. degree from Murray State University and her M.A. from Vanderbilt. 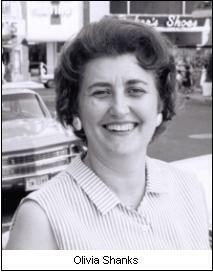 After teaching in the public schools for several years, she joined the mathematics faculty of Ward-Belmont College in 1949. She continued in that role (through the transition from Ward-Belmont to Belmont College) until 1959, when she came to Vanderbilt. Her first position at Vanderbilt was that of Assistant Director of the Master of Arts in Teaching Program. When that program expanded to include all of the teacher preparation programs at Vanderbilt, her title was changed to Assistant Director of Teacher Education. In that position Shanks became the Vanderbilt expert on teacher certification. Not only did she advise students and faculty on certification problems; she also served as Vanderbilt’s primary negotiator with the State of Tennessee in the establishment of certification programs. She retired in 1980. In their work at Vanderbilt, Olivia and Baylis Shanks went far beyond their official duties. Literally hundreds of Vanderbilt faculty, mathematics graduate students, MAT students, undergraduate mathematics majors, visitors, and other members of the Vanderbilt community enjoyed their hospitality at receptions and dinner parties. Because the fellowship was invariably cordial and warm and the food always delicious, invitations to the Shanks home were highly prized. Vanderbilt is fortunate to have had the service and devotion of Olivia and Baylis Shanks for so many years.